Travelers in search of the most festive side of Mexico need not look any further than Xcaret's Xoximilco. 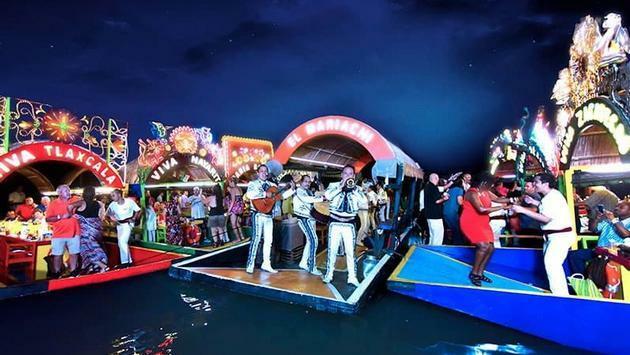 The Mexican floating fiesta tour is ideal whether you're celebrating a major life achievement, looking to make some new friends in a new destination or simply revel in one-of-a-kind Mexican tradition, culture and folklore. Available to both adults and children, Xoximilco takes guests on a tour through channels in Cancun and Riviera Maya via a 20-person trajinera or Mexican gondola. During your time onboard you'll sample delicious Mexican cuisine and sip classic tequila as well as dance and sing along to traditional live music courtesy of the onboard mariachi. Guests will also be serenaded with banda, marimba, jarana and norteno music. While the good vibes are constantly flowing, there's always something new and exciting to look forward to for return guests. For example, Tuesdays and Fridays feature thematic nights transporting guests back to the 1990s with Xoximilco Retro. What's more, on Thursdays, you can sing and dance while paying homage to renowned Mexican singer-songwriter Juan Gabriel. The fun begins even before you've boarded the trajinera as you'll participate in a Mexican kermes featuring games, snacks and delicious Aguas frescas—Mexico's refreshing, healthy and delicious fruit drinks. For more information on Xoximilco and Experiencias Xcaret, contact your travel agent or visit their website here.